Is it hard to be famous in 1870's Paris? Ask the sharp-shooting contest winner Miss Nelly McKay, formerly of Butte, Montana. She is already walking the thin line between fame and infamy when she is noticed by Chancellor Bismarck and the German Secret Service. Yet all she ever wanted was to marry a gentleman! 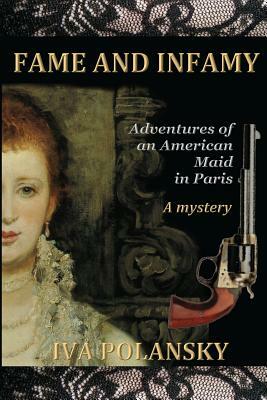 Fame and Infamy is an entertaining blend of comedy, mystery, romance and hard facts. Sarah Bernhardt and Victor Hugo are among the celebrities who share the scene with gritty characters emerging from the bohemian Latin Quarter. Paris, mopping up after the twin calamities of war and. revolution, provides a background for this hearty clash of French and American cultures. Author Iva Polansky thrusts readers into the heart of Paris in the late 1800’s with her colorful, adventurous heroine, Nelly McKay. Nelly is a sharpshooting, independent woman from the wild mining town of Butte Montana. An invitation to be a ladies maid brings some stability into her life with the added bonus of travelling to Paris. But things do not unfold as planned and soon Nelly finds herself embroiled in a love triangle and plenty of conflict. Fame and Infamy is a lushly decadent story, elegantly written, and sure to charm. The historic details pertaining to Paris were beautifully presented and easy to imagine. And of course, one cannot help but fall in love with Nelly, who is courageous and bold and fiercely liberated. It is easy to turn the pages of this novel because the plot keeps building and building in a stunning crescendo until all is revealed at the end. A highly entertaining story!